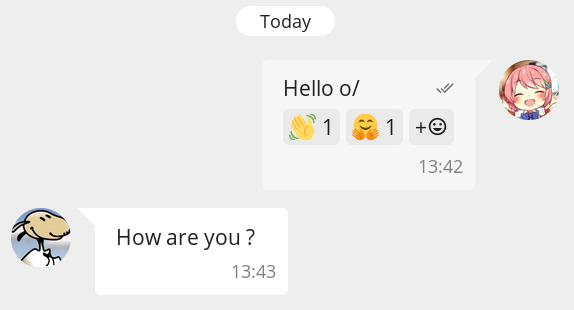 Movim is the first #XMPP client that supports #message reactions! We are using the recent XMPP standard XEP-0367: Message Attaching to provide this #feature in the project. You can already try it out on the official pod nl.movim.eu. This feature is available for the one to one conversations but also the chatrooms 😊 Have fun! To continue to build #Movim and introduce awesome new features such as message reactions we need your help. Please visit our Patreon page to help cover our expenses and fund new ideas and projects around Movim. Wow, that is super cool! Now we settled that, can we reuse it for posts as well and replace the likes ;)?